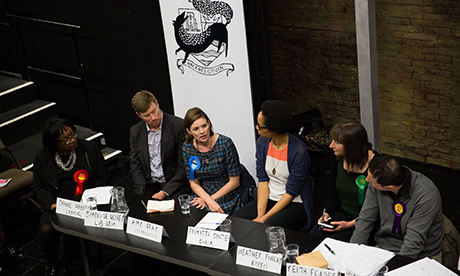 With panels of eight candidates in the north and a whopping eleven in the south, the Citizen’s hustings was always going to be a squeeze. The MP hopefuls were given a cruel one minute to hold forth on giant issues such as housing, education and inequality. Credit therefore to the candidates for being such great sports, and to our Arcola chairs Ben Todd and Feimatta Conteh for their fastidious timekeeping. 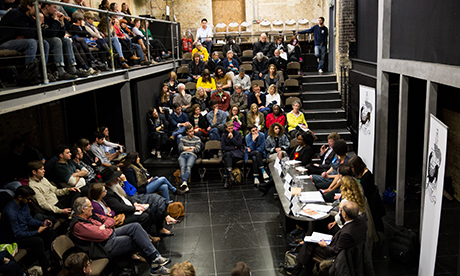 The candidates had to tackle six pre-planned questions on the subject of: inequality (especially in Hackney); housing, including the question of right to buy; jobs; education, and the growing shortage of school places; planning powers; climate change, and the UK’s 80 per cent emissions cut target by 2050. Here is how everyone did. 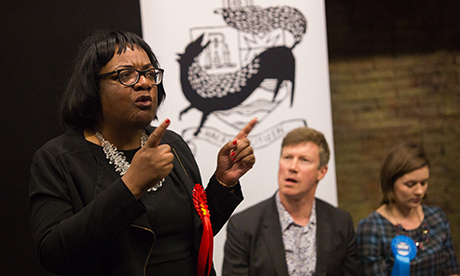 Diane Abbott (Labour) Despite drawing a few giggles from the audience with her statement that she has “never believed in the doctrine of the safe seat”, the incumbent put in a solid performance. Perhaps her most impassioned speeches came on the cutting of mare nostrum rescue effort in the Mediterranean. Simon de Deney (Liberal Democrat) wore a rather dashing floral blue shirt, which even complemented his Lib Dem counterpart’s in the South. De Deney insisted that if you vote Lib Dem, you will “wake up happier” next Thursday. He said local people should have foremost say and that the Lib Dem manifesto is about handing power back to the people. 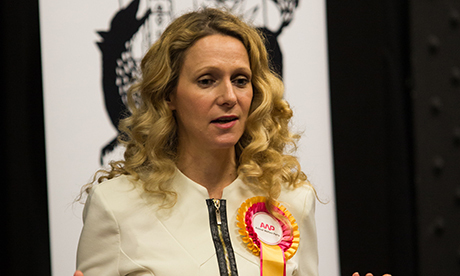 Amy Gray (Conservative) said Hackney needed a “fresh local voice” on issues such as education. She took strong stances on many of the questions. On Trident, an audience member asked: “Would you press the button?” Gray responded: “I would find it hard, but if it was between us and them, I probably would, yes”. When the issue of climate arose she scorned those who used their tumble dryers. Heather Finlay (Green Party) worked hard to make Green policies sound like good old-fashioned common sense. She called fossil fuels a “bad investment”, said that schools need a “coherent system”. On Trident, she took a different tack to the Conservative candidate, saying: “If nuclear weapons become the only way to stay safe, everyone will use them, and the world will become less safe.” Slightly outgunned by her more flamboyant adversaries, she nevertheless came off well. 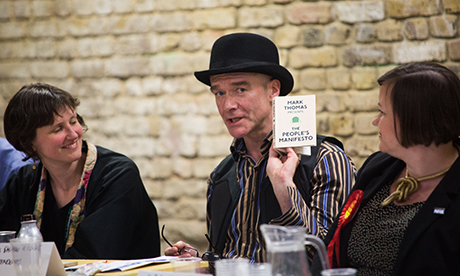 Keith Fraser (UKIP) soldiered on through as best as a UKIP candidate in Hackney can, appearing far more moderate in person than in his press releases and on social media. Fraser invited everyone in the audience round to his for dinner to illustrate the problem of overcrowding in the UK and said that “uncontrolled immigration” was stopping the government’s ability to plan school places. His best moment was probably making one of his points ‘off the record’ to a room full of people clutching iPhones and recording equipment. How the audience roared. 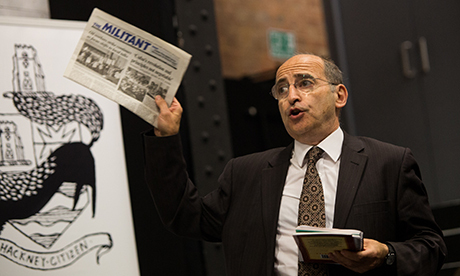 Jonathan Silberman (Communist League) seen below brandishing the communist newspaper ‘The Militant’, was an impressive orator. ‘There’s no housing crisis for the ruling rich”, he boomed. Apart from somewhat alienating the audience by repeatedly declaring: “tweeting is hopeless”, and relating everything to the struggle in Cuba, his performance was enjoyed by all. Meg Hillier (Labour) put in a professional performance but kept a low-profile. When asked if MPs should give up their Commons seat if they do not carry out pre-election pledges she said she would not resign if she couldn’t carry out everything she had promised. “I try to be very transparent, and publish a monthly report on everything I do,” she said. On environment she said the coalition government had “failed to develop” green industries. Ben Mathis (Liberal Democrat) said while in theory he had no objection to Right to Buy, the Conservative Party’s proposals were “essentially confiscation of property at the government’s behest”. Charlotte George (Green Party) came out strongly against the building of luxury flats, calling for longer tenancies to protect renters. 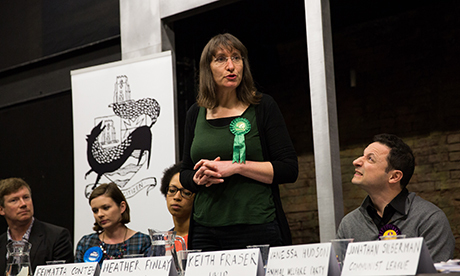 She called for electoral reform because in case no one had noticed – Hackney Greens would rather like proportionate representation! Brian Debus (TUSC) was one of the more animated characters, standing up to deliver his speeches. His finest moments were talking about the wealth gap: “If the minimum wage had kept pace with chief exec pay since 1999, it would now be £18.47 per hour. That shows the way this country has gone.” On the environment he said there had been “lots of fine words” but “little action”. Gordon Shrigley (Project for an unidentified political object) For a man with no policies, Shrigley was by many accounts one of the most articulate candidates on the panel. Whether on loopholes around provision of social housing, Right to Buy (“I don’t see why I should get a £100,000 discount on the backs of other people”) or on stigma surrounding cancer, he more than held his own against those who did have policies. Taiwo Adewuyi (Christian People’s Alliance) called for more funding for mental health workers, and charities doing “great work”. He said he had signed a petition against TTIP. 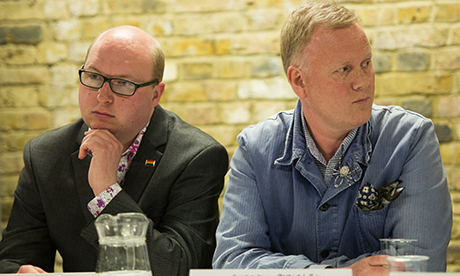 Paul Birch (Cannabis is Safer than Alcohol), the leader of a single issue party and proud of it, skilfully wove cannabis into every question asked. Legalising cannabis is the answer to a reduction in crime, said Birch, it would create jobs and, a bit tenously, even provide homes (houses previously used for growing would be fed back into the housing market). Angus Small (UKIP) kept rather quiet. 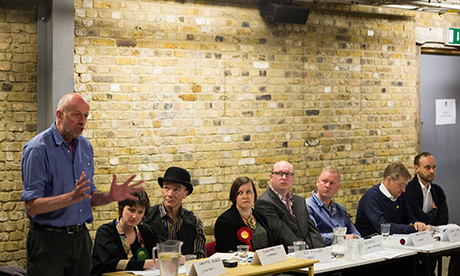 He raised gasps from the audience when he said UKIP would only allow UK citizens to buy their own council homes. Like Keith Fraser in the north he related the shortage of school places to the “inflow” of immigration. He was the only person to get heckled. Bill Rogers (Workers’ Revolutionary Party) sent his apologies.